November | 2015 | And I am an afrotasticlady! 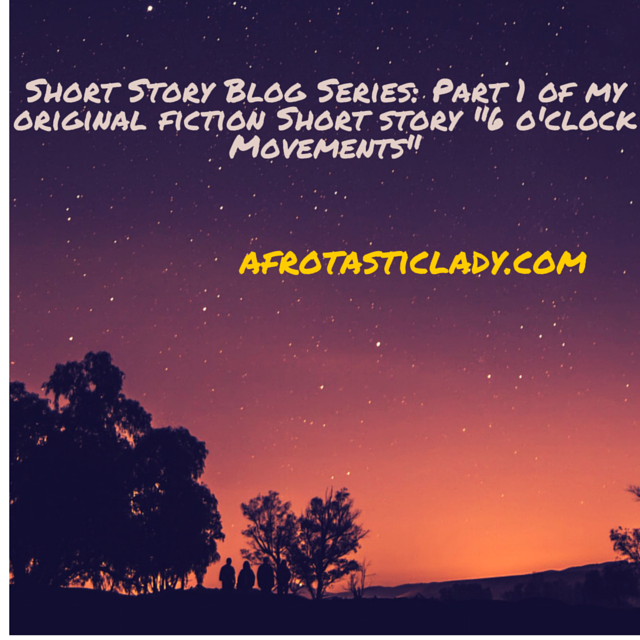 Thank you so much to everyone who read my short story “6 o’clock Movements.” I enjoy writing short stories, and I am thinking about occasionally putting short stories on my blog. 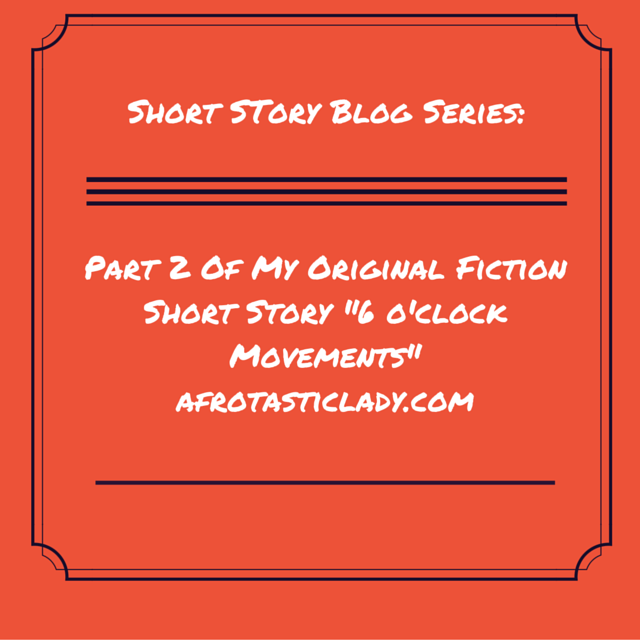 And if you haven’t checked out “6 o’clock Movements” in its entirety, please head on over to the first part and read it until the fourth and last part. “Yeah,” Benjamin pondered the verse and tugged at his ears. He felt like he had been such a “bad” Christian in the last year and a half. The layoff contributed to his sad and angry moods. He constantly bickered with Asha. Sometimes, he ignored the children. He attended church services with his family, but he half heard the sermons. “Um…Daddy should be home in a little while! Okay, baby?” Benjamin heard Asha tell one of the children. “Who’s that Asha?” Benjamin asked. Aima, with her two afro puffs, tottered around the house and usually destroyed the Leggo buildings or crafts that Gabriel and Julian created. She was a miniature version of Asha, as she was spunky and gregarious. “Asha, I’m just so tired of this. I feel like I’m carrying all of this mess all over the place. It’s exhausting,” Benjamin grumbled. “Hi Dad-dy!” Aima greeted in her squeaky voice. “Hi baby! What are you doing?’ Benjamin asked. “Say bye to Daddy!” Asha told Aima. “I love you too!’ Aima giggled and returned the phone to her mother. When Asha was pregnant with Aima, Jeremiah told Benjamin, “That baby girl is gonna have you whipped around your finger. You know how girls are with their fathers.” Even though Jeremiah did not have any children of his own, he had shared some wisdom with Benjamin.Jeremiah was a few years older than Benjamin and had been serving God longer, so Benjamin appreciated their brotherhood. “I’m sorry about that, Ben. Aima really wanted to talk, “Asha stated. “It’s okay. Had to talk to my little lady anyways. Um..I was just saying before that I’m pretty exhausted and tired of carrying this mess. I feel like I’m carrying all of this stuff,” Benjamin replied. “Um..I have trouble believing that sometimes. My faith is low,” Benjamin coughed. Benjamin grabbed the bottle of Ibuprofen and tossed it into the compartment. “I know…I know…” Benjamin replied. “Baby, where are you?” Asha questioned. “Are you coming home? Or did you decide to leave us?” Asha’s voice quivered. “No. I don’t wanna leave girl,” Benjamin replied. “She’s just assertive like her mama,” Asha giggled, and then she began to weep. “You keep saying ‘yeah’ to everything. I don’t know what you want me to say,” Asha yelped. “Hurt yourself? You wanted to take your life! You’re just using cute little words now. But you wanted to rip yourself away,” Asha sounded as high pitched as Aima’s voice. “Okay…cause I’d probably be a hot mess if you did. You know?” Asha’s voice lowered. “Okay, alright. Did Jere end up calling you? Cause I told him to call you?” Asha’s screeched. Benjamin removed the phone from his ear and exhaled. Goodness Asha, he thought. Benjamin returned the phone to his ear. “Yeah, yeah, I got his message. Your brother is ‘good peoples.’ He told me I could call him if I needed to talk.” Benjamin observed cows snipping at the tall grass at a nearby farm. “Yeah,” Benjamin continued to watch the spotted animals. He needed to take the children to a farm. With all of the stress surrounding his unemployment, he was distracted whenever he took the children to an outside activity. Four missed calls. Four voicemails. Asha had called three times. Asha’s brother Jeremiah had called once. Benjamin was glad that he liked his brother-in-law. When Benjamin first met Jeremiah, Jeremiah was quiet and frowned at him like he was an expired piece of food. A month later, Jeremiah informed Benjamin that Asha had a challenging break-up and he did not want to see Asha endure sorrow with another man. Jeremiah described Benjamin as “good peoples” when he discovered that Benjamin had prayed about Asha before he asked to make their relationship serious. “Let me see what these people want,” Benjamin dialed his voicemail. “Ben. Benjamin, where are you? You’ve been gone for a while, and the kids are asking about you. You just walked out of the house. Like you didn’t care or something. I know you’re tired. You’re angry. I guess you’re angry at God. I don’t know. God’s done a lot for us. He’s been helping us but I don’t think you see that. I don’t know Ben. Just bring yourself home,” Asha pleaded on the voice message. “Hey man, it’s Jer. Asha’s worried about you. She called me, crying. Said you ran out of the house after a fight. You know you can talk to me, man. It’s irritating, I get it. But you can’t be acting how you acting right now. Alright…call me when you get this message,” Jeremiah said on his voice message. “Daddy. Daddy. I wanna play Leggos with you. Julian made you a house. A big house. We want you to seeee it,” Gabriel, his five year old son whined. By the fourth message, Benjamin had closed his eyes. “Benjamin, did you get my last message? I called you. Did you forget that you have kids? They are over here. They asking me “Where’s Daddy?” I don’t know where Daddy is. I don’t know why you won’t call me back. I don’t know why you ran outta the person like some crazy person. You’ve been gone since 9 this morning. Ben… God’s got us. He’s been got us,” Asha’s voice sounded softer, and she was sniffling. “Baby… you’ll get a job. I know it’s been a while. But you will get a job. A real job. I love you. Call me back, please!” Asha finished. Asha. His brown woman. His wife who wore a pink,pixie hair cut. Benjamin was raised on Southern Gospel music like The Blind Boys of Alabama but when he met Asha, he learned to like her Christian metal music. He did not even know that brown folks liked metal music. Benjamin laughed at the recollection. Then, he looked at his phone. The screen displayed that it was six o’ clock. “I’m hungry, “Benjamin placed his hand on his stomach. His stomach was plumper than before. Benjamin usually heard the cliche comment “You look like a basketball player” when people looked at his tall and muscular body. With his ravenous eating and lack of exercising, his muscles were transforming into mashed potatoes. Benjamin realized that Asha served dinner around this time. He enjoyed eating her home cooked meals, especially her vegetable lasagna. Call your wife, Benjamin heard. Benjamin realized that the enemy was not speaking to him. God was speaking. He did not want to hear God. “No!” Benjamin pounded the steering wheel. “I’m done, Lord! Like what am I supposed to do? Survive on unemployment and church donations forever. I got a family to support,” he shouted. He picked up the bottle of Vodka and sniffed it. “I can’t even drink this junk anymore. Too strong,” Benjamin laid the bottle on the passenger seat floor. Benjamin looked at his phone again and selected Asha’s name in the contact list. “Benjamin. I called you. Like twice,” Asha picked up on the first ring. A bottle of Vodka and a bottle of Ibuprofen were sprawled on the passenger seat of his car. Vodka was a strange beverage for him to be drinking. In college, he had attempted to drink a cup of Vodka at a fraternity party, but the alcohol scraped his throat. He could not continue drinking, and the fraternity guys laughed at his innocence. Now, Benjamin shoved the Vodka bottle into his mouth. He swallowed the raw liquid and let out a gruff “aaah.” He turned his head to his driver’s window and observed the people entering and exiting the Western Massachusetts Rite Aid. A young woman yanked her two year old daughter out of the sliding doors. Her red hair was in a loose bun. She wore yoga pants with a large hole in the right knee area. Her slender child moved in the opposite direction. She screamed “C’mon kid!” and tears exploded on the child’s cheeks. Some of the customers scowled at the adult and child as they interacted with each other, but none of them interrupted the battle. Benjamin quickly rolled down his car window and heard the expletives that flowed out of the mother’s mouth. He knew he should intervene, but his stiff body would not respond to his compassion. The mother dropped her bags and pulled the terrified child towards her face. A middle aged woman with wavy, grey hair wrapped in a bun, slowly pushed her shopping cart towards the entrance. Again, the child tried to remove herself from her mother’s thin arms. Despite the mother’s skinniness, she appeared to be a strong woman. The mother let out a final swear to her daughter and spat on her face. Benjamin shook his head and stared at the adorable child in denim overalls. “Mum-my…I hurt,” the child wailed. The middle aged woman left her cart and ran over to the woman and her daughter. “You don’t spit on a child like that. Is that your daughter?” the middle aged woman asked. “Yeah, it is my daughter and this ain’t none of your business,” the mother responded. “Honey, are you alright?” the middle aged woman bent down to the child’s level. “Get away from her, nosey!” the mother slid her body between the middle aged woman and the child. “You don’t need to be a mother! What’s wrong with you?” the middle aged woman yelled. “Lady, I don’t even know you, and you think you can tell me something!” the mother yelled back. Benjamin rubbed the sides of his face, and then grasped one of the dark coils of his small Afro. He did not want to listen to this confrontation anymore. His mind was already confused. He brought the bottle of alcohol to his mouth and drank it the same way his own kids drank their juice boxes. They titled their little heads and gulped until it went down the wrong way. They never heeded Benjamin’s instructions to “slow down.” They dealt with the effects of their quick drinking: strained coughing. Benjamin ripped the Vodka bottle from his mouth and hacked. He was removing himself from his empathy. The middle aged woman could solve the situation between the mother and her child. He turned on the engine and peeled away from the parking lot. “Where am I going?” Benjamin questioned himself. This country town was different from his home. Down the street from the Rite Aid, there was a Moms and Pops store and an old fashioned movie theater with only two titles on the placard. As he drove out of the downtown area, vast farms approached him. His two year old daughter Aima, would have danced as soon as she saw the animals. She recognized animals well and amused the family with her imitations of cows, horses, and pigs. Benjamin smiled and thought about Aima’s high pitched voice making a “moo” sound. Benjamin stopped smiling and grimaced when an agitated driver rushed past him. “Dang man, where you going?” Benjamin shouted and waved his fist. Drowsy, Benjamin pulled over to the side of the road. His head dropped on the steering wheel,and he began to moan. Full moans. Moans that would have frightened his children if they were in the back seat. Benjamin blinked, and tears trailed down his cheeks. He turned his head towards the bottle of Ibuprofen. That bottle looked more glorious to him than his Bible looked. Take them, he heard in his mind. He grabbed the bottle and massaged it in his hands. He slouched down in his seat and spun the bottle. Benjamin sighed and dropped the bottle back on the passenger seat. He took his phone out of his pocket. Perhaps, my partying, swearing, and drunkenness do not seem too “bad,” but I did not feel right. I believe that if I had continued to be a partier, it might have led to some other toxic choices. But in October 2004, I went to a Gospel concert on campus that was hosted by a Christian student organization. I was surrounded by folks who were singing passionately about God. After the concert, I went to my dorm room and called my parents. I asked them to pray the prayer of salvation with me. They led me to Christ. And I have been tightly holding onto God’s love for the last eleven years. I wanted to share a video of my small rendition of “How He Loves” by John Mark McMillan. Again, I am not a singer; I just like to sing. I blame it on several years of participation in school choruses. How have you been impacted by God’s love?